Black and White 2 have been full of surprises hasn't it? are you expected some, unimaginable spin on the Battle Subway, if you did you are bang wrong unfortunately. The Subway is actually nearly identical to the first game. Trainers, prizes and everything! Well, not all is the same, there's one small interesting difference. This is the first, and only real note of difference, instead of casually walking your way into the Subway, you are first challenged by the, leaders of the area, the Subway Masters, in a double battle. After that, you're free to enter the area. 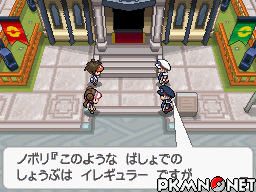 The Battle Subway has 8 lines, 7 are with specific battle circumstances and all of thoserequire you to beat seven trainers in a row for Battle points. This works exactly like it does in the games before it, the more trainers you battle, the higher your streak, the more battle points you receive and the harder the battles become. It's worth noting all battles bring your Pokemon's level to 50 regardless if they are over or under it. However, there's one noticeable difference in the Battle Subway from the usual Battle Tower/Frontiers and such is that the three Battle Modes (Single, Double, Multi) have a Normal Line and a 'Super' Line. But to gain access to the Super line you must gain a 21 battle streak on the Normal corresponding line and face the relevant Subway master (as shown down below.) Its worth noting, in the normal lines, only Pokemon from Unova will be used, while in the Super variations you'll be fighting a much wide range of Pokemon. After you've won 21 win streak in the Normal line you won't go further in that line and will restart from battle one, the Super lines will still be open though. Brown Train to Anville Town. After all that trainer grinding, you'd be wanting to see a bit more action, right? Well here you go. 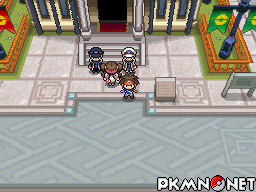 Here are the special trainers and their team you can fight in the Subway. After a 20 win streak on the Single Battle Line only, you'll come across one of the Battle Subway Masters again! After 48 on the Super Single Battle Line you'll be treated to him again.. There's also a master for double battle modes who will fight you after 20 battles on the Double Battle Line. And again after 48 battles on the Super Double Battle Line. 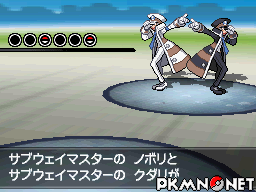 Its not over for you, because in multibattle, after 20 battles on The Multibattle Line, the Stylish duo will team up on YOU! And again after 48 battles on the Super MultiBattle Line. Now, here is where you can spend your hard earned BP. So there you go. Enjoy yourself!